North of Ardestie Farm and the major road works now taking place can be found one of the most interesting links to the past. Many of the `in comers` to Monifieth are totally unaware of the souterrain attached to stone dwellings probably built in the first century AD. The souterrain or underground passage was a covered chamber for storage or cattle shelter used by the occupants of the houses. It could also have served as a place of safety when hiding from marauding tribesmen or sea faring enemies. The occupants were not warlike people, rather growers, fishers and hunters perhaps similar to what we would today recognise as crofters. This picture shows the settlement of stone houses at Ardestie, with the Laws Hill Fort in the background. It is written that in what we know as Scotland, in prehistoric times when the total population amounted to around two hundred and fifty people, the only collection of human dwellings was to be found at Ardestie. 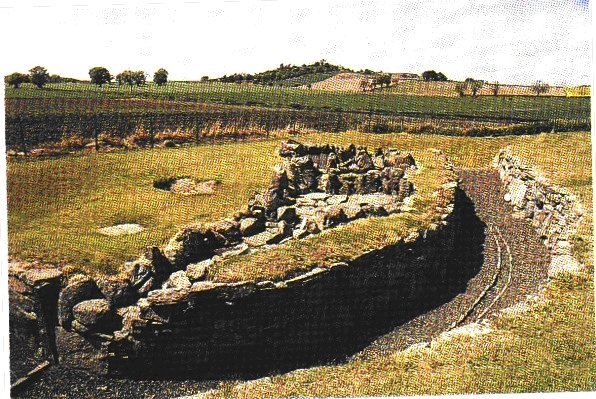 Other similar dwellings have been uncovered at Ardownie and Carlungie. According to the Romans the Picts had no forts, this would seem to be disproved by the nearby `vitrified` fort , believed to have been there for over four thousand years.